Sun., Nov. 26, 2017, 4:35 p.m. If you were harboring a thought any game the rest of this torturous Seattle Seahawks season would be easy, disabuse yourself of that notion now. This Seahawk team isn’t going to do anything easy. Not even when the opponent is the 1-10 San Francisco 49ers. And the road crowd is made up of a majority of Hawk fans. Yes, the Seahawks won 24-13 to move to 7-4, still within striking distance in the NFC West. But it was a struggle from the very first play, when Russell Wilson was picked by Eric Reid. That set the tone for a slog of a first half in which the Hawks’ only touchdown came after a spectacular Bobby Wagner interception set up the offense at the San Francisco 17-yard line. When the teams retired to the quiet solitude of the locker room – as opposed to the quiet solitude of the field in front of thousands of empty seats – Wilson’s passer rating was rivaling his waist size and the offense had just 129 yards. The second half was marginally better, with two decent length drives that ended in touchdown receptions by tight ends Nick Vannett – his first – and Jimmy Graham. But as the rest of the schedule goes, this was the biggest breather and it took until the second half before anyone could breath easily. Next week the 10-1 Eagles come to town. They are followed in order by: a trip to 7-3 Jacksonville; the 8-3 Rams visit in the game that should decide the division race; a trip to 5-6 Dallas, who will be welcoming back Eziekel Elliott; and then the home finale against 4-6 Arizona. OK, that last one should be a breather too. But who knows? Offensive coordinator Darrell Bevell tried to stick with the running game Sunday, giving this week’s featured back Eddie Lacy the ball 17 times. That resulted in 46 yards. Total. Wilson was off-target in the first half, was hurt by four drops, then got going after intermission. Still, his quarterback rating only rose above 80 in the final minutes and his yards per attempt was less than 7 yards. Plus, there was still the little problem with the protection, despite Luke Joeckel’s return. There was just nothing easy about this one. Or the next one. Almost as if it were CenturyLink Field. Well, not really. There is nothing remotely CenturyLink like the 49ers home field these days. Maybe the rain, but the atmosphere is almost non-existent, forfeiting any home-field advantage San Francisco might hope to enjoy. The “Sea-Hawks” chant wasn’t the only one that echoed through the place. And whenever Seattle did something noteworthy, the noise level wafting through the television’s sound bar went up a notch. About the only time the noise level ratcheted up for the 49ers was in the final seconds when designated savior Jimmy Garoppolo came off the bench to throw a last-second touchdown pass. Kam Chancellor is out. Ditto Richard Sherman. Cliff Avril is sidelined. And yet the Seahawk defense continues to carry it weight – and then some. There is one reason. Wagner is still playing. 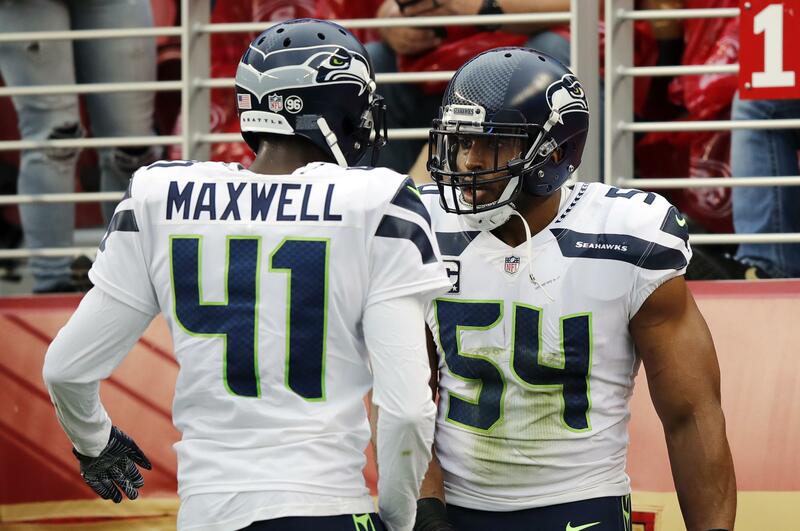 The Seahawks middle linebacker is putting together another solid-to-spectacular season. He finished with eight tackles, all but one of the solo variety. He had two tackles for loss. He defended passes, plugged holes, made the calls and was the first player to arrive whenever a defensive teammate was slowed by an injury. He also gave the offense the field position it needed in the first half, ripping the ball away from Trent Taylor at the 17-yard line, giving Wilson a short field to attack. Wagner doesn’t have a fancy nickname with boom involved. But he does deliver hits that can be described that way. Will it be enough to not only earn Pro Bowl recognition, but something more as well – like a defensive player of the year award? It, like everything else in this Seahawk season, won’t be easy. Published: Nov. 26, 2017, 4:35 p.m.